The Centre IRIS (ex Institute for Blind and Partially Sighted Children Ljubljana) is an institution of national importance as it is the only public institution in Slovenia working in the field of education of children and young people with visual impairment, including those with multiple disabilities, from pre-school to the end of secondary education level. It also provides consulting, training and support of the target group and its immediate and wide surroundings. Its founder is the Government of the Republic of Slovenia. Training of special education activities for blind and partially sighted pupils and students, namely O&M (orientation and mobility), communication skills, ADLs (Activities of daily living), sport and leisure time activities, social skills and socialization. Supporting the inclusive forms of education and providing training for professionals in mainstream schools who teach visually impaired pupils and students. 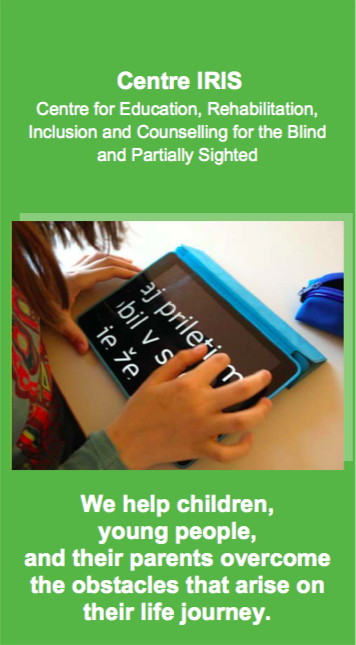 Helping and supporting parents of visually impaired children and young people. Providing adapted materials and other teaching/education resources. Raising awareness and informing the public about special needs of people with visual impairment. Development of the field and cooperation with similar institutions at home and abroad. 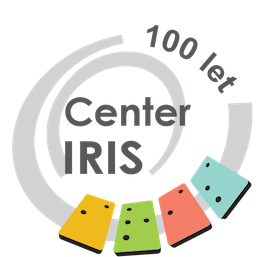 You can always send us an email on info(at)center-iris.si. We are located at the edge of the city centre on Langusova street 8, next to the Ministry of Public Administration.